Yay for the weekend! Today's not going to be an easy day for me because I'll be at work doing an end of the year inventory, but I am grateful that it's a short day. I'm looking forward to enjoying my short weekend, and I hope most of it is spent indoors. It's suppose to be unusually cold here in SoCal and with the Christmas shopping traffic, I have no desire to be out and about. I love Christmas but I hate all the pushy advertisements and the shopping rush that ensues. It sort of takes all the joy out of the holiday, IMO. Whilst I was ravaging the CVS near my house for the semi-annual clearance items, I managed to pick up a few Revlon Colorstay polishes including Amethyst. I've forgotten how wonderful the formula is for these polishes, they're smooth, creamy, opaque and a breeze to apply. I used two easy coats here and no topcoat because it dried relatively shiny on its own. Amethyst is a gorgeous shade of purple, and truly reminds me of its namesake with an innate glow from within. I can't believe how beautiful this simple purple shimmer is, and for 75% off, it was a complete steal. I love CVS because you can easily get extrabucks and coupons to use towards your purchases. Here with the 75% off clearance prices, I was able to use a $2 off $10 coupon that I received in my email. After using this Colorstay, I definitely plan on using my other untried Colorstays immediately. Next, I wanted to try a glitter gradient, so I used Liquid Glam Lacquer Night Lite which contains gold, blue, and fuchsia glitters in a clear topcoat. Formula was remarkably liquid-y and not thick like normal glitter polishes. In fact, I had difficulty controlling the amount of glitter because it kept pooling quickly from the brush onto my nail. As a result, I had some thick patches of polish in those areas that took forever to dry down. This is finished with a layer of my Poshe/GCS mix. 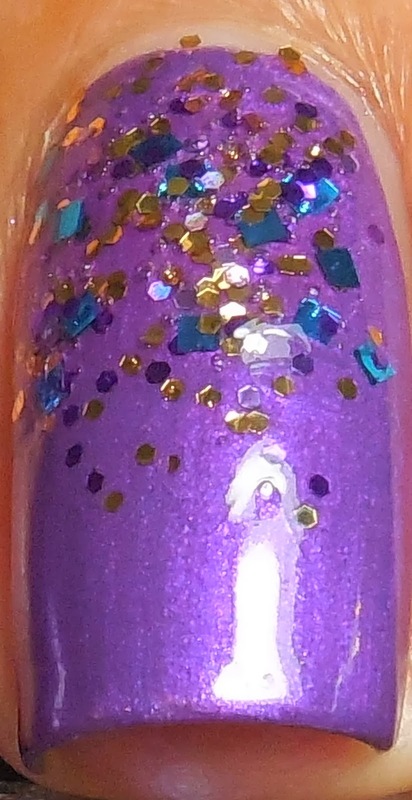 I love how festive this glitter gradient turned out, despite the thickness of the polish. The fuchsia glitters got a little lost in the Amethyst background, but I've never been good at choosing a good base color for glitter toppers. A gradient was a good choice because it helped minimize the crazy sparkly-ness of this glitter bomb and let the lovely bottom base color to show through. Are you good at choosing base colors? Should I have used something more neutral for Night Lite? thank you! I love that purple!